David Carter and his friends head to the Tyrusian base on the dark side of Earth's moon to put a stop to the meteor attacks. The Dragit begins the countdown to the invasion, while the shuttle begins its countdown to launch. David Carter contacts Major Stark and Sergeant Romar for help. Together, they try to alert the President about what's really behind all the meteor strikes. A animated TV series based on the first Double Dragon video game. Comedic take on New York Mayor Bloomberg's soda ban, with satirical commentary from Jimmy McNichol & Kristy McNichol. 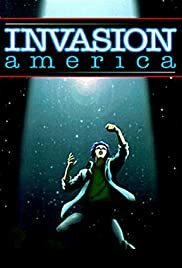 Invasion America was the first prime time animated dramatic mini-series, but set itself apart in more ways than that. Produced by Steven Spielberg (E.T., Jurassic Park) and Harve Bennett (Star Trek), and voiced by Timothy Daly (From the Earth to the Moon) and Leonard Nimoy (Star Trek) it set new standards in animation, science fiction, and dramatic story telling. In the six, forty-five minute episodes it takes time to tell the story from the first book (of five?) there are a few spots where the dialogue could be better, or where the plot could be stronger, but these are few and far between. The story ends strong with a few good strings where the next story will pick up. Overall an excellent mini-series!